The Traveler Series introduces the core of what our company has been doing for over 15 years which is making high level packaging to make sure that the products you transport reach their destination safe and secure. We have taken our packaging expertise and incorporate it into Pelican cases to create a masterful product designed for endurance and protection. Specifically designed to transport 6 laptops and note books up to: 15.6 x 11 x 1.65 inches. 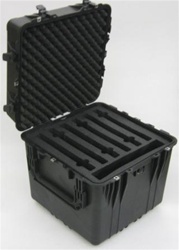 Made up of a Closed Cell Polyethylene insert and combined with the Pelican 0350 case this is ready for the long hall. It has inserts for up to 8 notebooks (Laptops) and an accessory slot as well for your power cords, mouse (Mice) or whatever else you may want or need to take along. 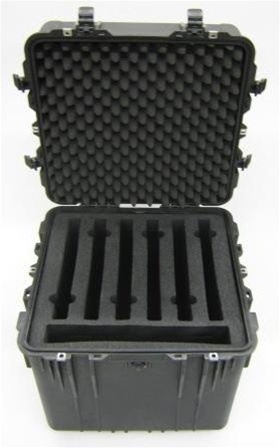 This case is great for Trade Shows, Mobile classrooms, Training centers, Sales forces.